Slavery caused the war, but the war was not begun to free the slaves. The war was begun to determine whether the Confederate States of America would be allowed to break away as an independent nation, or whether the existing Union would survive. Only later did the conflict become one of liberation. Why did the South want independence? Southern wealth was mostly invested in slaves or slave-worked land. Abraham Lincoln, newly elected president, led a party pledged to ban slavery in new states. That would leave the slave states a dwindling minority too weak in Congress to prevent abolition of slavery. Seven slaveholding states seceded following the election. When the United States Army garrison, Fort Sumter in South Carolina, was taken by the Confederates, Lincoln called on all loyal states—Virginia included—for militia to suppress the rebellion. Although not all slaveholding states of the Upper South seceded, Virginia did, refusing to participate in an invasion of the Deep South. This online exhibition, like the physical version of the show, is divided into two parts that pose a series of questions. Waging War examines how the conflict was fought and Surviving War measures the impact of the war on civilian life. "So Glad God's Sending The War"
Enslaved African Americans generally welcomed the war as an end to intolerable conditions. Former slave Charles Grandy remembered, "All dem what could pray ‘gin to pray more’n ever. So glad God sendin’ de war." One of the worst abuses was the slave auction, a horribly degrading experience in itself and one that often separated family members. Virginia novelist George Tucker wrote, "One not accustomed to this spectacle, is extremely shocked to see beings, of the same species with himself, set up for sale to the highest bidder, like horses or cattle." Here a British artist dared to record the spectacle, though he idealized it. 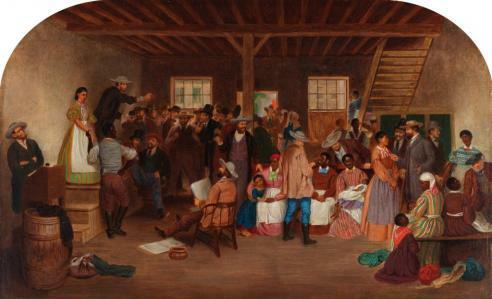 Because of the critical need for black labor, auctions lessened during the war, but they did not cease. Harriet Beecher Stowe’s Uncle Tom’s Cabin was one of the most influential books in American history. Its story of abused slaves fueled anti-slavery feeling. One southerner who objected to Stowe’s harsh depiction of slavery wrote a rebuttal called Life in the South: Or "Uncle Tom’s Cabin" As It Is. It portrayed slaves as contented and well-treated. When John Brown attacked Harpers Ferry in 1859 in an attempt to ignite a slave rebellion, did he act alone? 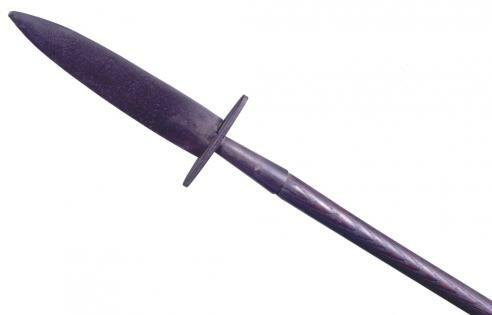 This is one of 950 pikes purchased by Brown to arm slaves. His small group of northeastern abolitionist supporters provided financial support, but white southerners mistook them as representing the sentiment of the entire North. After Brown’s execution, a Virginia secessionist sent a pike to each governor of a slaveholding state as a symbol of “the fanatical hatred borne by the dominant northern party to the institutions & people of the Southern States." 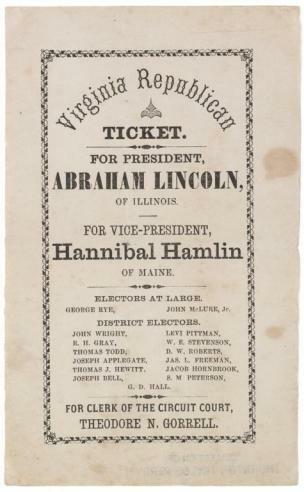 There were four major candidates for president in 1860. Northern Democrats supported the right of territorial residents to decide the issue of slavery without federal interference while Southern Democrats endorsed a federally mandated slave code for the territories. A new middle group, the Constitutional Union Party refused to take a position for or against slavery or its expansion. The Republican Party determined to bar the expansion of slavery into the western territories. 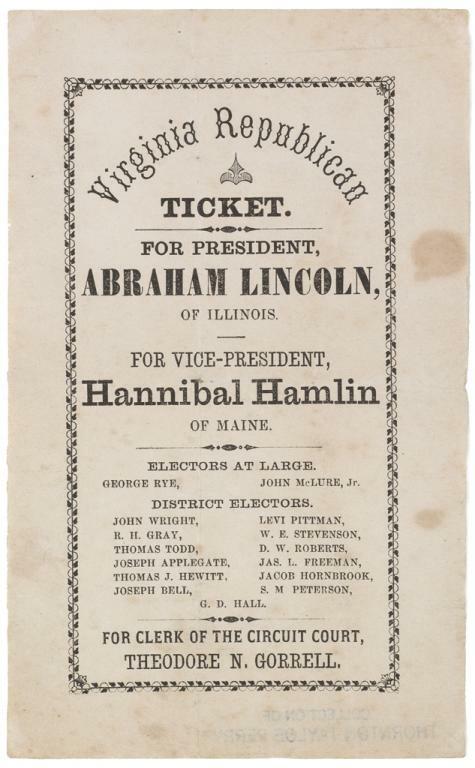 Lincoln’s Republican Party was not even on the ballot in most of the South. In Virginia he received fewer than 2,000 of 167,000 votes, mostly from counties that later became West Virginia. Lincoln’s victory prompted South Carolina to secede from the Union. An American Turning Point: The Civil War in Virginia, an exhibition commemorating the 150th anniversary of the American Civil War, was on display at the society from February 4 to December 30, 2011. Learn about the abduction of Pocahontas in 1613. Formerly an English manor house, Virginia House was relocated to Richmond in 1925. Conclusion - Did the Civil War End at Appomattox?